Earth, Fire, Air and Water have for centuries been acknowledged as the Classical Elements. Where better position to bring these forces of nature to life than in a bathroom. Clay is a material of the earth long used in the manufacture of domestic items. It is often used as a symbol representing the beginnings of life. Fire as a symbol represents passion and assertiveness. In science and religion regularly acknowledged as the force that brought all life to creation. Fire is used to form the clay into a durable material as in ceramics and pottery tiles. Air is the medium in which we perceive and are inspired. It is the space, void, atmosphere. Water, well what is the most important feature of any bathroom? That life giving force that without life would cease to exist. Of course in the context of this article, the topic relates to the use of clay and other base materials formed to create stylish and hardwearing bathroom tiles and furniture. And why should bathroom furniture have to be bland and often out of sync with the interior design of the rest of the home. Burgbad is a supplier whose name is barely known to domestic end users and rarely used by interior designers. Their range of bathroom furniture is available in so many finishes and colours with fabulous shapes, a seemingly endless range of sizes and plenty of styles. 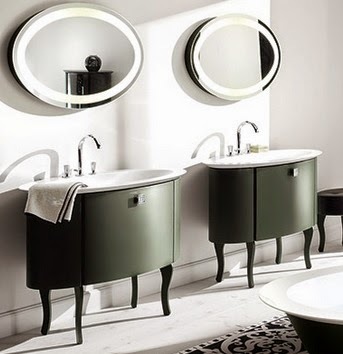 Their Elysee range is evocative of the Italian brand Selva, although what is shown here is fabulous German design. With their products being dimensionally flexible allows for small, medium and larger bathrooms to be well supported in their extensive product range which includes shower trays, basins, baths, cabinets and mirrors. While their use of ceramics is extensive, they also have basins which are mineral cast which allows them to manufacture unique shapes using quartz, rock powder and pigments. 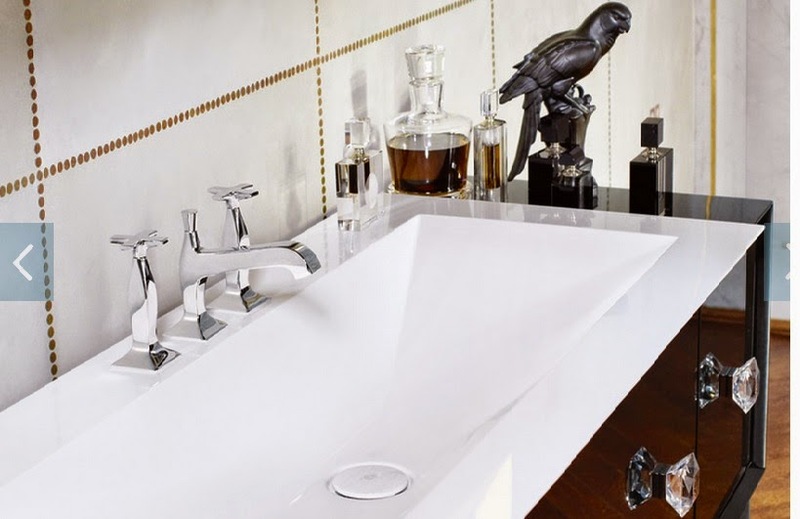 The processes used to fire the material make their basins incredibly hardwearing, seamless and stain resistant. The front surfaces can be made of veneer, lacquer, thermoform, melamine and glass- all in a wide selection of colours. And we like the choice of different handles, especially the glass on the Elysee range above. There is also a range of mirrors and lighting which completes the overall look. It is time to rethink the way bathrooms are designed. The bathroom is part of the overall interior design of a home and is not just a purely functional room.